NES Tengen Tetris (USA) "30 lines" in 00:29.09 by mcwave. 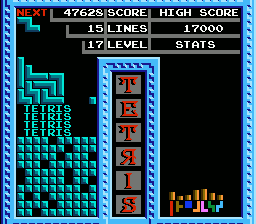 Tengen Tetris is a version of Tetris made by Atari, which pretty much follows the basic formula of stacking tetrominoes and completing lines. Even the theme music has a similar feel to the more familiar NES Tetris game by Nintendo. This movie plays through just the final level, level 17, and clocks in at just over one line per second. Notably, luck manipulation does not work the same way in this game as in other versions of Tetris, leading to quite different strategies.